Is a ‘Great Reset’ of our economy inevitable? Are we experiencing an end to the long-term trend of a rising standard of living in our country? Are we due for a “Great Reset” of our economy, one that is inevitable due to the competing interests of workers and consumers? A reset is hard for us to see because changes “seem to be gradual and slow”. And new government policies meant to steer the economy “are no more than changes at the margin”. Are millennials bearing the brunt of this reset? … Wages for the typical graduate of a four-year college have dropped more than 7 percent since 2000, and the labor force participation rate of the young has been falling. One consequence is that young people are living at home longer and receiving more aid from their parents. They also seem to be less interested in buying their own homes. Megan McArdle explains that we brought the “Great Reset” on ourselves, with our desire for rising, stable wages that conflicts with cheap services and goods. … The reset may not be fair. It will certainly not be easy. But it may be necessary. Tyler Cowen, “Don’t Be So Sure the Economy Will Return to Normal”, New York Times, May 15, 2015. Megan McArdle, “U.S. 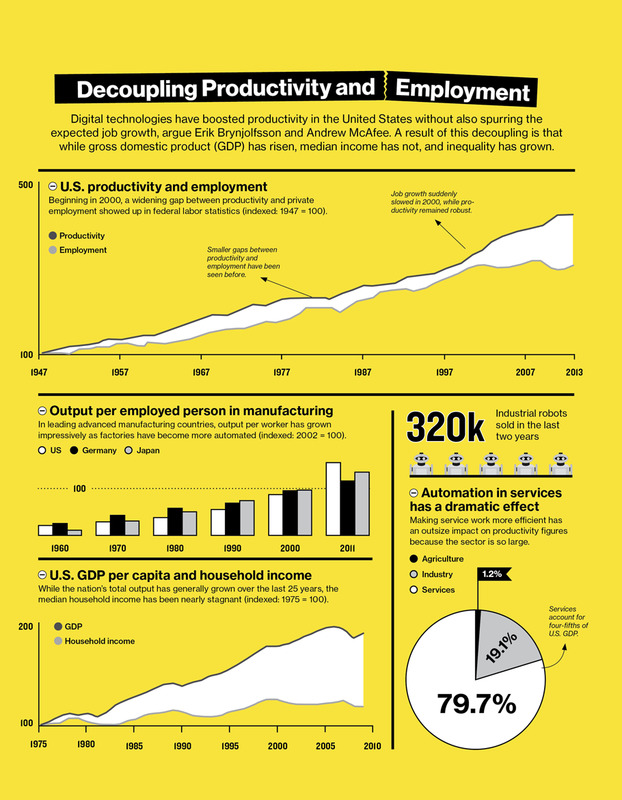 Workers Brought the ‘Great Reset’ on Themselves”, Bloomberg, May 19, 2015. 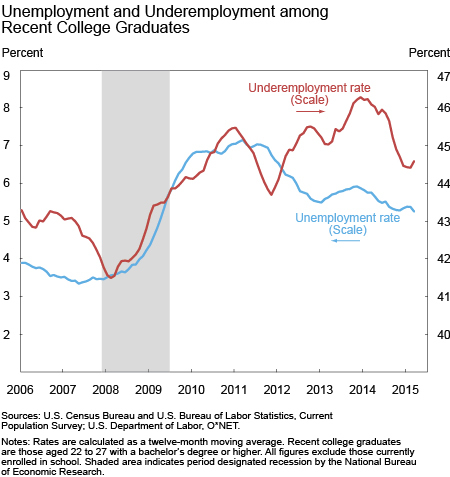 Posted in jobs after college | Comments Off on Is a ‘Great Reset’ of our economy inevitable? A new analysis from the San Francisco Fed finds entry-level earnings for new college grads — defined as working graduates age 21 to 25 — grew only by 6 percent from April 2007 to April 2014. In comparison, median weekly earnings for all workers grew two-and-a-half times as fast, at 15 percent. And while recent grads tend to fall behind after any recession, the gap since the Great Recession has been both wide and long-lasting. Is this cyclical or structural? 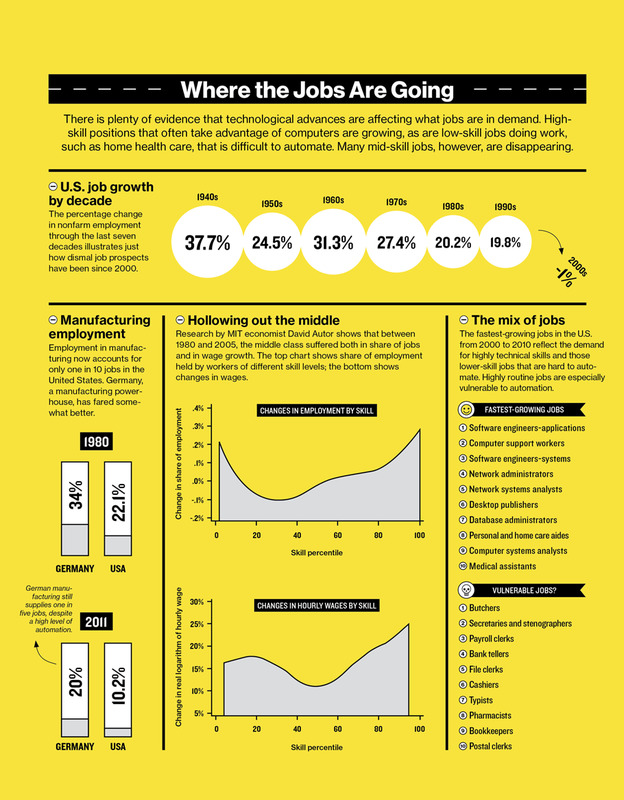 There are differences of opinion about whether this stagnation is due to a short-term economic downturn or arises from a more fundamental problem, “like a mismatch between recent grads’ skills and open positions”. 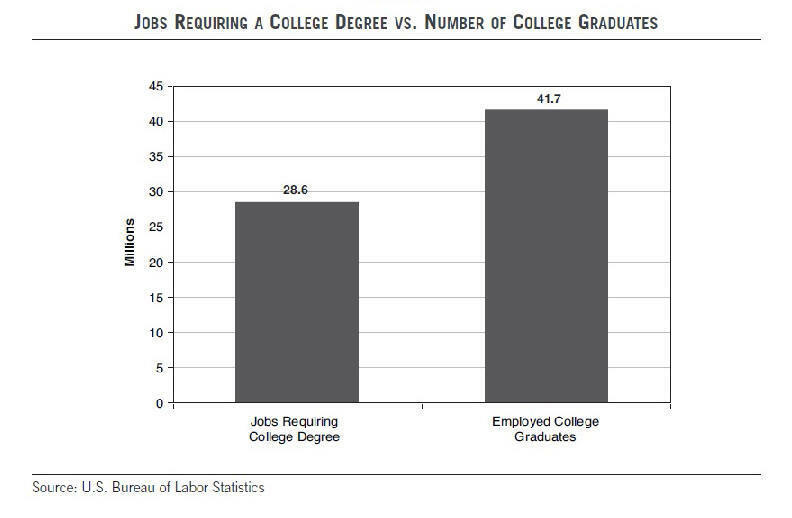 One thing that seems clear is that as the percentage of the population with college degrees continues to increase, there are “too many college graduates chasing too few college-level jobs”. 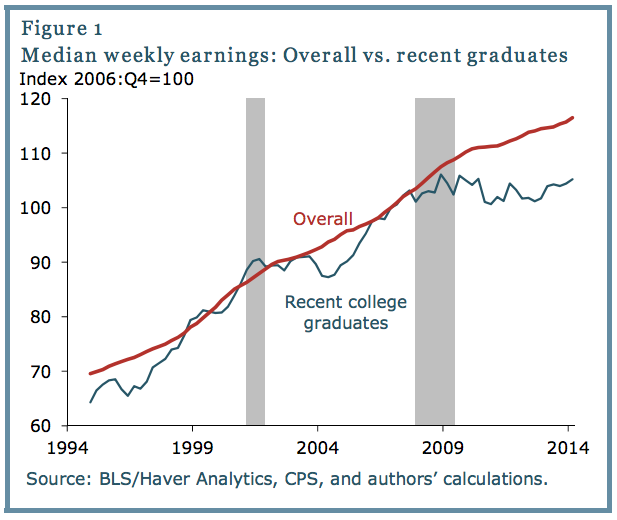 Danielle Kurtzleben, “Young college grads’ wage growth is falling farther and farther behind”, Vox, July 21, 2014. JONAH GOLDBERG: Education is important and necessary for a host of reasons. But there’s little evidence it drives growth. Nasim Taleb, author of “Antifragile: Things That Gain From Disorder,” argues that education pays real benefits at a micro level because it allows families to lock in their economic status. An entrepreneurial father can ensure his kids will do OK by paying for them to become doctors and lawyers. But what is true at the micro level is not always true at the macro level. Think about it this way: Growing economies spend a lot on education, but that doesn’t necessarily mean that spending makes them grow. During the so-called Gilded Age, the U.S. economy roared faster and longer than ever before or since, while the illiteracy rate went down. But the rising literacy didn’t cause the growth. Similarly, in the 20th century, in places like China, South Korea and India, the economic boom — and the policies that create it — always come first while the investments in education come later. Jarrett Skorup looks at higher education spending. There is no link between higher education subsidies and economic growth, and none between college degrees and job creation. Since 1980, Michigan has spent a much higher proportion of personal income on state government support for higher education than nearby states like Illinois and Ohio. According to Ohio University economist Richard Vedder, by the year 2000, the Mitten State was spending the sixth most in the country (2.34 percent of its personal income), double what Illinois was spending and much more than Ohio. This did not lead to higher growth as Michigan’s economy performed among the worst in the country during that time period. And states with a higher proportion of college graduates do not necessarily grow by adding more college degrees. A comparison of the number of state residents with a college degree with per capital income growth from 2000-2008 yields no correlation. 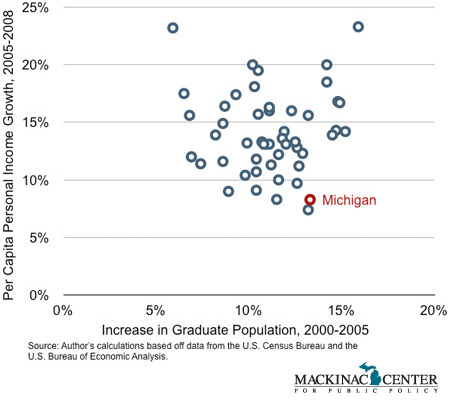 James M. Hohman of the Mackinac Center for Public Policy sees “no correlation between a state increasing its college graduate base and growing its economy”. 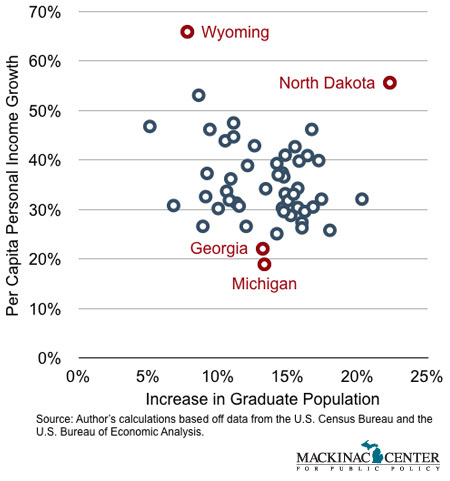 If the hypothesis promoted by Glazer and the lobbyists engaged by Michigan’s tax-supported public universities was correct, the various points on this chart would be clustered around an upward sloping line, as states with higher growth in the number of grads also enjoyed relative improvements in income. However, no such trend line exists. Another chart that built in a lag time also showed no correlation. … The chart below compares state grad growth between 2000 and 2005 and income growth in the three succeeding years; once again no pattern can be detected. So many factors enter into economic growth, making it believable that education spending would not be a driving factor. An August Pew Research Center study found that many in the middle-class are divided on how they believe this gap widened. Student loans are a reason many young people are not buying homes and “will be a drag on the economy for the foreseeable future”. According to a recent Federal Reserve study, only 9 percent of 29- to 34-year-olds got a first-time mortgage from 2009 to 2011, compared with 17 percent 10 years earlier. “First-time home buyers are typically an important source of incremental housing demand, so their smaller presence in the market affects house prices and construction quite broadly,” Fed Chairman Ben Bernanke said at a homebuilders’ conference in Orlando on Feb. 10. Recent college graduates carry an average debt load of more than $25,000, limiting their ability to qualify for mortgages even if they’re able to land a job in a market with an unemployment rate of 9 percent for 25- to 34-year-olds. Dubbing it a “student loan debt bomb,” the National Association of Consumer Bankruptcy Attorneys (NACBA) warned on Feb. 7 about the effects of rising student debt on recent graduates, parents who co-signed their loans, and older Americans who’ve gone back to school for job training. 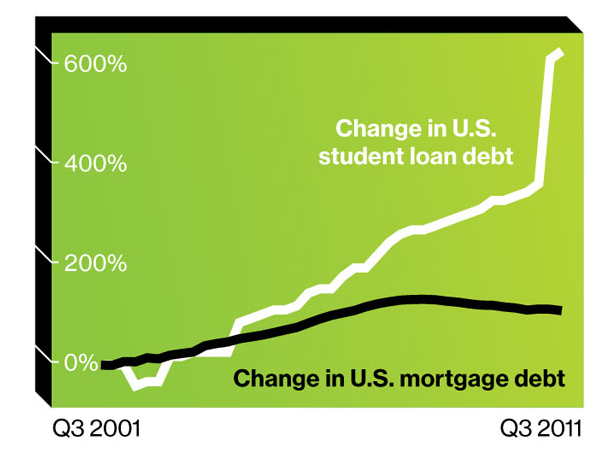 “Just as the housing bubble created a mortgage debt overhang that absorbs the income of consumers and renders them unable to engage in consumer spending that sustains the economy, so too are student loans beginning to have the same effect, which will be a drag on the economy for the foreseeable future,” John Rao, vice president of the NACBA, said on a conference call. A silver lining for rental construction, but will that be the next bubble? Although housing prices have fallen by about one-third from their 2006 peak, young adults who are starting to move out of their parents’ houses want to rent, not buy. While single-family housing starts posted their worst year since 1963 last year, multifamily housing construction has surged as more Americans rent. I would not urge most young people to buy a home today unless they find themselves in an unusually favorable situation. It’s just too risky. The NY Times has a nifty calculator that helps determine Is It Better to Buy or Rent?